History of an Icon - Auto-Ordnance | Original manufacturer of the world famous "Tommy Gun"
Anyone who has watched an old movie or browsed through a book on World War II will quickly recognize the familiar outline of this fine weapon. That finned barrel topped off with a Cutts compensator, the square receiver, either a drum or box magazine... the famous "Thompson Submachine Gun." 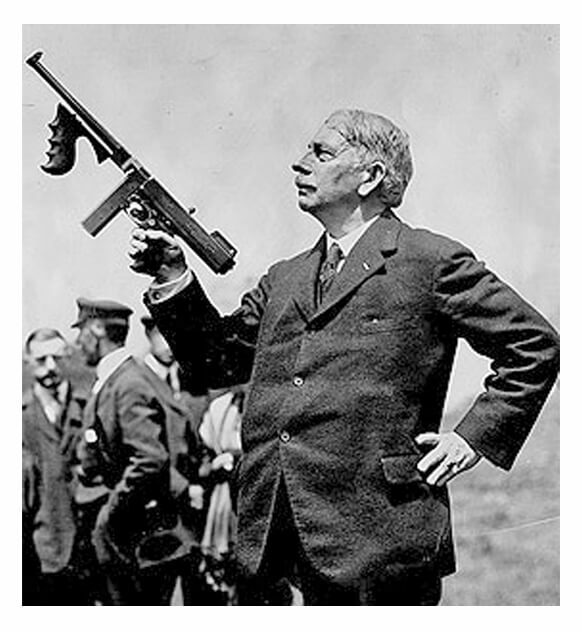 Although "submachine gun" is an familiar part of today's gun owner lexicon, the word was created by the man who was responsible for bringing us this great gun. John Taliaferro Thompson was born in 1860 and graduated from West Point in the class of 1882. Upon commissioning, he entered the army in the Artillery, later transferring to the Ordnance Department in 1890. During the Spanish-American War he distinguished himself when he directed the supply of munitions at a time of near chaos in the Army's ordnance and quartermaster units. Thompson was involved in the testing and adoption of the Springfield M1903 rifle. He became famous for tests he conducted that resulted in adoption of the .45 caliber as the official U.S. Army handgun cartridge. Various calibers were tested on cadavers. Later, in the slaughterhouses of Chicago, he conducted tests on beef cattle to determine the best cartridge. From these tests it was determined that the .45 was the only acceptable cartridge for a handgun and thus leading to the adoption of the Colt .45 M1911 automatic. In November 1914 he retired from the service with the intention of devoting his full time to perfecting an automatic rifle. He was to join Remington Arms Company as their Chief Engineer. There he was responsible for organizing the construction, outfitting and operation of a rifle factory at Eddystone, Pennsylvania, to produce the British Enfield rifle. In 1916 he set up another factory to produce Mosin-Nagant rifles for the Russian Army. When the United States entered World War I, he was recalled to active duty and was instrumental in adapting the British Enfield rifle to .30 caliber and producing it as the M1917. Promoted to brigadier general, he was responsible for the supply of small arms and ammunition to the Allied Expeditionary Force (AEF) in France and by all accounts performed these manifold tasks with the utmost efficiency. As a result, Thompson was awarded the Distinguished Service Medal. In December 1918 he retired from the service for a second time. Thompson's primary interest remained the development of an automatic rifle. He believed an "intermediate" automatic weapon in the ballistic class between the pistol and the rifle would be a requirement in future wars. In Thompson's mind to accomplish this end meant overcoming several obstacles. He rejected gas operation as being too complicated for a shoulder arm. Recoil operation, he believed, would result in a weapon with too much weight. Blowback was not suitable for a powerful military cartridge. This list of obstacles nearly exhausted the then available methods of operation. He also wished to develop a system unencumbered by the patents of large firearms companies and the hefty patent license payments that came with them. Commander John Blish, U.S. Navy, had in 1915 patented a delayed blowback breech system in which a sloping metal wedge interlocked the breech block with the gun body. Under high pressure, as when the cartridge fired, the angle of the slope was such that the mating faces jammed solid. As the pressure dropped, the faces were able to slip across each other, the wedge moved up due to the slope, and the breech unlocked. Thompson, after investigating Blish's invention, offered Blish shares in a company he was forming in exchange for the patent. Blish accepted and with the financial backing of Thomas Ryan, the Auto-Ordnance Company was founded in 1916. The first gun produced, bearing neither model or serial number, appeared in 1918 and was belt fed and with little resemblance to later Thompsons. This was followed by the Model 1919 in .45 caliber. Provision was made for feeding by a box magazine while the rear grip was placed near the back of the receiver. One distinctive feature was the firing pin fabricated as forward extremity of the actuator. The cyclic rate of fire was approximately 1,000 rounds per minute. Some reports indicate that prototypes were made to fire various calibers. In 1920 the prototype was tested by the U.S. Government. On April 27, 1920, the Springfield Armory conducted functioning tests of the weapon. Test results were impressive: 2,000 rounds were fired with only one stoppage. A few months later the Marine Corps tested the weapon with similar results. Although the results were impressive, neither service recommended adoption. The first production model was the Model 1921. A distinctive change was the elimination of the barrel jacket to protect the shooter's hands which was used on earlier models. All later model Thompsons assume the characteristic appearance of the Model 1921. Components for the Model 1921 were manufactured in a single lot which would equal 15,000 guns. This was probably due to anticipated fast sale of the new gun. The Model 1921 never sold in great quantities to any purchaser and was not adopted by military forces although tests were conducted in Belgium and England. This model was an abortive attempt to use a cartridge with better ranges up to 650 yards. The cartridge used was the .45 Remington-Thompson, bullet weight of 250 grains reaching a muzzle velocity of 1,450 feet per second. The cyclic rate of fire for this model was reported to be 400 rounds per minute. The 1923, called the "Military Model," offered a horizontal forearm, detachable stock and sling swivels. A biped and bayonet were optional accessories. Sales were negligible and this model and ammunition are valued collectors items today. This model is simply the Model 1921 restricted to semi-auto fire. The action and magazines are the same as the Model 1921 and by the time it appeared on the market, a 100-round drum was available. In a catalog published by Auto-Ordnance in the 1930's this model is referred to as the "Navy Model," .45 caliber. The U.S. Navy ordered 500 of this model and helped keep struggling company alive. It was used by U.S. Marines in Nicaragua and was described as very effective in the jungle fighting. The catalog also notes this gun was then in use by the Army, Navy and Coast Guard. The "Navy Model" utilizes the horizontal foregrip, compensator and sling swivels although it was offered either with vertical or horizontal foregrip, with or without the compensator. The cyclic rate of fire was reduced to 700 rounds per minute. Although the proportion of Thompson submachine guns misused by Prohibition-era gangsters and Depression-era bandits was minuscule compared to the thousands used by American soldiers and lawmen, it is their lurid employment by hoodlums that is perhaps best remembered. In part we can thank the likes of Jimmy Cagney and Edward G. Robinson for this (personally I prefer Robert Taylor defiantly blazing away at the Japanese in the final scene of "Bataan"). Another reason is that the Thompson saw the most misuse in a day and age when some bandits actually sent out press releases (Remember "The Ballad of Bonnie and Clyde"?). The bandits loved the notoriety and a Depression-weary public ate it up. The fact that the Thompson featured in a few spectacular front-page crimes did nothing to help its image. The best known of these is no doubt the notorious "St. Valentine's Day Massacre" of 1929 when henchmen of the sinister Al Capone, who had conveniently alibied himself to Florida, mowed down seven members of the "Bugs" Moran gang in a Chicago garage. The truth was, the tommy gun was no more popular during the Beer Wars of the Twenties than "assault weapons" are with criminals today, for much the same reason -concealment (The tommy-gun-in-the-cello-case ploy probably worked for about a week). Gangland assassins, then as now, generally preferred a pistol at close range, or if silence was needed, an icepick or garrote. The Thompson was popular with most of the Depression-era bandits; most, but not all. The Barrow gang preferred 1918 BARs looted from National Guard armories, which they used to hose down pursuing police cars. Their nemesis, Capt. Frank Hamer of the Texas Rangers, preferred the model 8 Remington, and when his posse shot down the murderous couple in 1934, only one Thompson, wielded by a Louisiana deputy, was in use. The infamous George "Machine Gun" Kelly got his nickname from the Thompson he used on a summer night in 1933 to kidnap oilman Charles Urschel from his home in Oklahoma City. Ursehel was later released unharmed. Kelly did not have his Thompson, or much else, on him when agents of the FBI caught up to him. The terrified outlaw is reputed to have screamed "Don't shoot, G-men, I give up!!!" when they put the collar on him, thus accounting for the Feds' famous nickname. 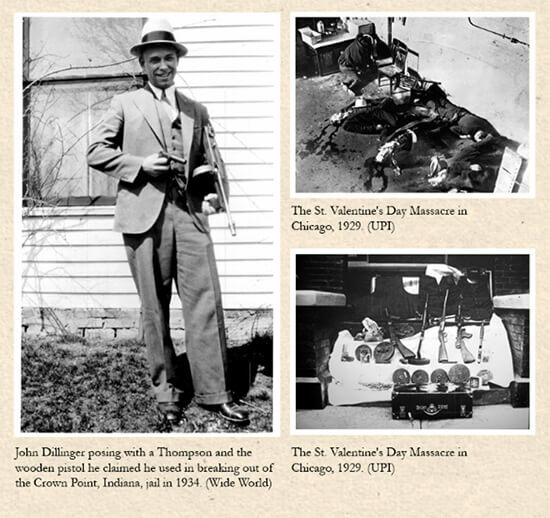 Thompsons, generally looted from small town police stations, along with early-day body armor were a favorite item for Public Enemy No.1, John Dillinger. The Dillinger-Nelson gang, along with their sometimes-cohort, Charles Arthur "Pretty Boy" Floyd (Oklahoma's contribution to the blemishes on the backside of society) liked to carry Thompsons with the buttstock removed and a 20-round clip in place of the familiar drum magazine. This way the gun could be concealed under an overcoat, and, if shooting was involved, fired one-handed, leaving the other hand free to carry loot, grab hostages, or steer the getaway car. It was this spray-and-pray approach that assured Dillinger a seat in the electric chair on January 15, 1934 when he killed Chicago Patrolman William O'Malley during a botched robbery. Because of this crime the law pursued the gang with a furious determination. The gang used their Thompsons to blast their way out of an FBI dragnet at the Little Bohemia Lodge in Wisconsin in April of 1934, but the Public Enemy's days were numbered. Dillinger only had a small Colt .38 automatic on the night of July 22 when Melvin Purvis and his G-men shot the outlaw down on a crowded Chicago street. The spray-and-pray-with-the-chattergun tactic also sealed Pretty Boy Floyd's fate on June 17, 1933 when his gang murdered four lawmen and a robber in their custody at the Kansas City train station. Whereas the public had greeted the St. Valentine's Day Massacre with morbid curiosity, their reaction to the Kansas City Massacre was one of outrage, and only the lawmen had Thompsons when they brought Floyd's bloody career to an end on October 22, 1934. For a time the psychotic Baby Face Nelson assumed the title of Public Enemy No.1. Nelson used a Thompson to murder two FBI agents on November 27, 1934, but it was also a Thompson that proved his undoing: Nelson's body was found the next day, pierced by 17 bullets from one of the agents' tommy guns. Appropriately then, it was the notorious ~chopper~~ that assured the triumph of law and order over the infamous criminals of old. Up to the beginning of World War II, the total Thompsons bought by the U.S. Army totaled less than 400. With the war came large orders and production became a problem. In the fall of 1939 the French ordered 3,750 Model 1928 guns and 30 million rounds of ammunition. Orders were also received from Sweden and England. In the U.S. the submachine gun was still considered an auxiliary weapon, but with the development of an armored force, large quantities were needed. The Model 1928 was simplified for mass production to meet this need. The lock, actuator, breech oiler, buttstock catch, compensator, and barrel fins were eliminated. A selector on the left side permitted full auto or single shots. In April 1942 it was dubbed the "Thompson submachine gun, caliber .45, M1." This variant did not see full production until 1943. This gun was produced by Auto-Ordnance at Bridgeport, Connecticut, and by Savage at Utica, New York. Army procurement records indicate Auto-Ordnance produced 847,991 guns while Savage produced 539,143. Savage subsequently produced a total of approximately 1,250,000 Thompsons prior to and during World War II. It is reported that Auto-Ordnance total production was slightly over 200,000. Serial numbers of Auto-Ordnance manufacture are preceded by "AO." The Savage productions has the letter "S" preceding serial numbers. All production guns were fed by a 20-round box magazines although those adapted prior to the M1 series could use 50-round drum magazines. The Thompson was most popular among specialized troops such as Rangers, Marine Raiders, armored and parachute units. It became somewhat of a status symbol and was eagerly sought after. Even today many veterans consider it the best weapon of WWII. 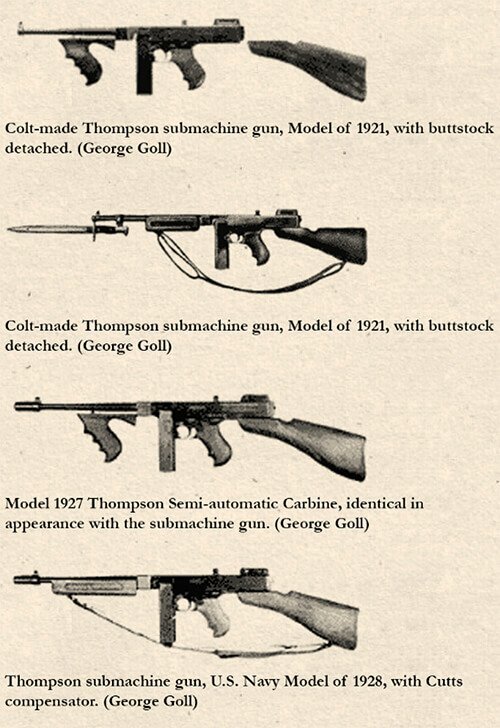 Although the Thompson had many good attributes and enjoyed a good reputation, it did have drawbacks. One of the most frequent "gripes" was its weight.. more than 10 pounds, heavier than the M1 Garand. As most submachine guns, it was difficult for the average GI to control in full auto fire. Some commanders said it wasn't any good beyond 50 yards. It, like other submachine guns, lacked penetrating power. As for General Thompson, he was never to see the overwhelming success of his gun as a military weapon. He died in 1940 at the age of 80 years, but he left his mark on the history of military weapons.